On a viciously cold and windy below-zero day, Feb. 8, Norb Walz was plowing snow by his rural St. Joseph house when he looked up and saw black smoke rising from his barn. The sight just about broke Walz’s heart. Just as he figured, the barn would be a total loss. Family, friends and well-wishers feel the same way. That is why there will be a fundraiser from noon-6 p.m. Sunday, April 14, at Milk & Honey Ciders. From every cider sale and from all tips, $2 will be donated to the Walz family. The cidery is just down the road from the Walz farm at 11738 CR 51. 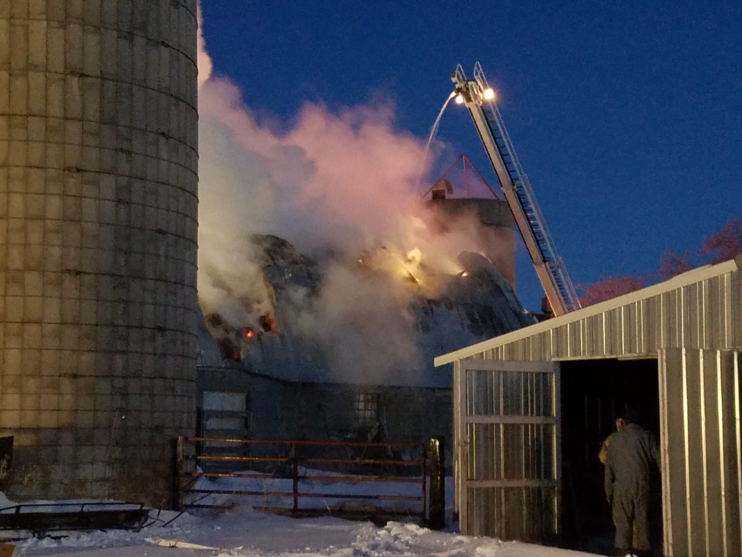 Walz is grateful that he managed to get one cow out of the barn after the fire started. The other animals, 20 of them (including one bull and nine calves), who were outside at the time, also escaped harm. However, after the barn was burned down, Walz had to sell them the next day. So many of Walz’s memories, good and bad, went up in smoke that afternoon. He recalled years of chores in every season – for instance, trudging through waist-high snow in blizzards to tend the animals in the barn and putting up bales of hay in the hay mow every summer – a heavy and sweaty job. But there are also good memories, he quickly added. The oldest of four siblings, Walz was born in 1957. Walz was raised on his parents’ farm, which is 1.5 miles south of St. Joseph between Kraemer Lake and the I-94 freeway exit. The Walz farmstead is the very definition of family personified. Norb grew up in the house on that property, a house that still exists. In 1961, his grandfather built another house. Both houses still exist, and Norb’s mother, Joan, still lives in the first house, the one in which Norb was raised. The farming life has been a rewarding one, said Walz, but it was at times not very financially stable. He had to take on two other jobs just to make ends meet. His wife, Mariette, has been a registered nurse at Country Manor in Sartell. His daughter, Kimberley, too, is a registered nurse who works at St. Cloud Hospital. 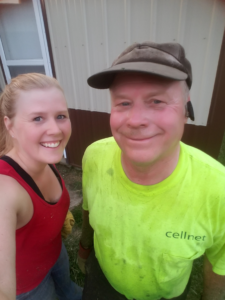 She is determined to rebuild the family barn and keep the farmstead in the family. Norb and Joan Walz also have a son – Jared, who is a teacher in the Twin Cities. As Walz pondered the devastating loss of the family barn, he also emphasized very positive sentiments. Firefighters, said Walz, not only battled the blaze courageously in bitterly cold weather until 11 p.m. that night, but they kept returning to douse flare-ups well into the next day. “I cannot thank all those people enough,” he said. The St. Joseph Fire Department responded to extinguish the fire. They were assisted by Avon, Cold Spring, Richmond, Rockville, St. Stephen and Waite Park Fire Departments. Norb Walz and his daughter, Kimerley, are deterimed to rebuild their family barn that burned Feb. 8.